It’s the British media’s favorite fantasy: Sinn Féin breaking with a century of practice and riding to rescue a dramatically close vote in the House of Commons. It’s also an insult to Irish voters. Sinn Féin’s two leaders, Mary Lou McDonald and Michelle O’Neill, visited London early this week to hold meetings on Brexit with Labour leader Jeremy Corbyn and Karen Bradley, the Tory minister with responsibility for the north of Ireland — previously renowned for her wildly insensitive and completely ahistorical comments on violence perpetrated by British soldiers in the north before the ceasefire. 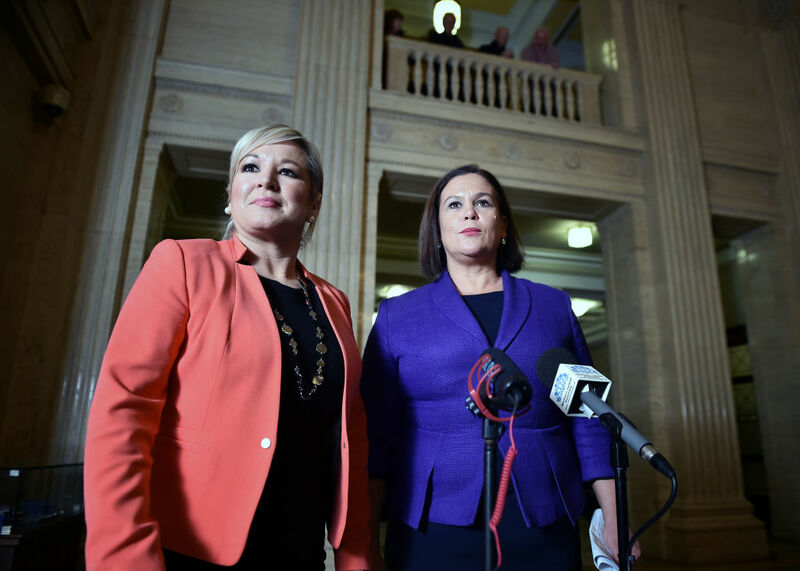 As always happens in press appearances by the party’s leaders, both were asked if Sinn Féin would take their seats in the British parliament to break the stalemate over Brexit, and both, as ever said they would not. The question is endlessly trotted out by the media and Sinn Féin’s political opponents. Recently, Fine Gael’s health minister Simon Harris tweeted criticism of the party for not taking their Westminster seats, a handy deflection from the health crisis currently underway in Ireland. Harris deliberately misrepresents the reason Sinn Féin practice abstentionism, while many others simply do not understand and have no desire to learn. As an Irish Republican party, Sinn Féin does not recognize the legitimacy of the British parliament’s sovereignty over the north or accept that it should have any say in matters relating to the island of Ireland. If Britain’s role is that of colonial oppressor, participating in the political process in Westminster constitutes an endorsement of that role and a hypocritical grab of power at the expense of moral values. Similarly, deciding not to campaign for those seats would be an act of surrender to the parliament many see as imposed on them: it would hand all representation to that chunk of the electorate who do accept Britain’s sovereignty. Another weak argument against abstention is that voters deserve to be represented in parliament. Haranguing Sinn Féin for not sending elected members of parliament to swear an oath to the monarch and vote in the chamber misunderstands the party’s voters. When Sinn Féin’s supporters vote, they do so in the full knowledge that the candidates will not take their seats: it’s a position supported by the electorate; they do not vote for the party and then feel cheated upon learning it is abstentionist. Their MPs do other constituency work, dealing with local problems and politics, lobbying in the United Kingdom, Ireland and recently, Brussels, but don’t enter the chamber. Anti-abstentionists argue that other voters in the constituencies deserve representation too; but this supposed problem exists for every voter who supports a party that doesn’t win in her constituency. If I lived in a Conservative seat but voted Labour, I wouldn’t feel particularly represented in parliament, but that’s the nature of our model of representative democracy as it stands. More irritating is the Westminster village obsession with treating abstention as a fanciful whim rather than a political tactic with deep historical roots. For many London political journalists, Sinn Féin’s only possible use is to ride to the rescue of some close parliamentary vote, deciding suddenly and unexpectedly to dash to the House of Commons and tip a division for Labour and bring down the government. It’s a mindset that reveals everything that’s wrong with political coverage in the media: the obsession with minutiae, backstabbing, backroom deals, gossip, and drama. For the most part, politics is drudgery, bureaucracy, and hard work behind the scenes. The media’s failure to understand why abstention is used — and how those refusing to engage with a parliament they see as illegitimate will not change their mind to prop up some small decision on voting night — is indicative of how little deep thought and historical weight is involved in writing and broadcasting in the current political cycle. But it also exemplifies a continued refusal to properly engage with Irish history beyond a Wikipedia level of knowledge. Abstentionism as a tactic and principle stretches back over a century, including one of the first female MPs elected to the Commons, Constance Markievicz, who refused to take her seat for Sinn Féin in Westminster in 1918. Irish parties and the DUP are still intellectually forced into the limited confines of Westminster expectations by journalists and British politicians: assuming Sinn Féin would rather win a short-term political victory over the DUP than uphold a century-old political tactic and moral principle; that the DUP will fall into line behind a larger political party for a sniff at power; that either party will fold under pressure in negotiations despite having more collective negotiating power than the rest of the political establishment put together. There are plenty of interesting questions that can be asked of politicians around Brexit. Constantly asking Sinn Féin if they’ll take their seats wastes time, insults voters, and exposes the lamentably limited understanding of whoever poses the question. Dawn Foster is a Jacobin staff writer, a columnist for the Guardian , and the author of Lean Out .